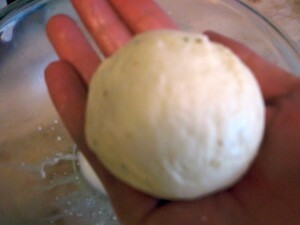 Learning to make mozzarella was a huge turning point for me. For a long time, foods held a certain amount of mystery for me. I took for granted what went into making certain things. I was a Food TV junkie that was an observer not a participant. 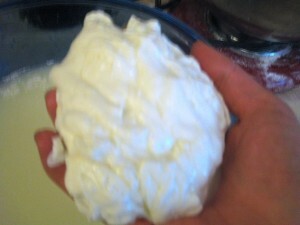 I’d seen at least a half dozen shows about making mozzarella, but never did I really consider making it. But, I found out it was EASY and it really did change my life. I guess my turning point was when I read, Animal, Vegetable, Miracle by Barbara Kingsolver. If you haven’t read this book, go and get it! It’s worth it. It’s the memoirs of a family that works as a family, eats as a family, and lives as a family should. Here is where I learned that you don’t have to be a chef to make good food. Through her experiences, she taught me to believe I could make foods I never thought I’d try. She discusses her desire to make cheese. Her desire made me curious to see if it was really as simple as she made it seem. That year, my wonderful husband gave me a mozzarella making kit from the place that Barbara Kingsolver mentions taking a workshop from, http://www.cheesemaking.com/. This started my love of cheese making and our very own pizza nights! NOTE: I would be remiss if I didn’t suggest using raw milk. I know there are skeptics, but I recommend reading The Untold Story of Milk to find out all the benefits of raw milk. We only buy raw milk and raw dairy products, all from 100% grass fed cows. Over warm heat, put the milk and citric acid/water in the pot and stir until combined. Let sit until the milk is approx 88F degrees. When milk is approx. 88F degrees, turn stove off (but leave on burner for residual heat) and put in the rennet/water. Stir until combined. Let mixture rest for at least 10 min. NOTE: Inevitably, at this point – someone or something is always dragging me away. Just know that I have left it on the stove for over 15-20 min and it was fine. This is a very forgiving recipe and I haven’t had a bad batch of mozzarella yet! 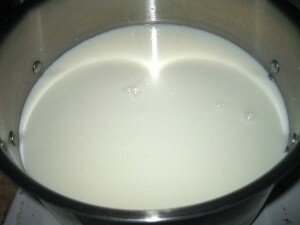 After 10 minutes, you will notice that the milk will have solidified – almost like jello. If it isn’t like this, than wait a few more minutes. 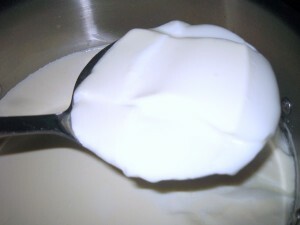 When the milk is solidified – cut the “curds”. Take a butter knife and cut the curds into strips, both horizontally and vertically. Then take the knife (and following the other cut lines) cut at a 45 degree angle down each original cut. This will allow the whey to escape from the curds. Scoop curds into a large bowl. I usually eyeball it, but scoop about 1/3 of the curds into the bowl. Gently press as much of the whey (clearish liquid) out of the curds and drain. Microwave for 1 min, then press and knead the cheese again with hands or a spoon to remove more whey. If it is too hot, you may use rubber gloves – but I have not tried this. I like to feel the texture with my hands. Microwave two more times (about 35 seconds each) kneading between each heating. At this point, you should salt the cheese. Using cheese or kosher salt helps preserve the cheese and give it more taste. Honestly, without the salt – the cheese has very little taste. Recently, I discovered adding seasoning to the salt made my mozzarella turn from good to gourmet! I use everything from basil to combination salt blends. I take a small dish and pour about 2 tbls of cheese salt and 1 tbls of other herbs combined. I add 2 pinches of my mixed up cheese salt to each ball of cheese. Knead and pull until it’s smooth and elastic. When you can stretch it into ropes like taffy you are done. If the curds break instead, they need to be reheated a bit. Once cheese is smooth and shiny, it’s essentially done. I have attempted making small tiny balls (like in caprese salad), but they don’t look uniformed. 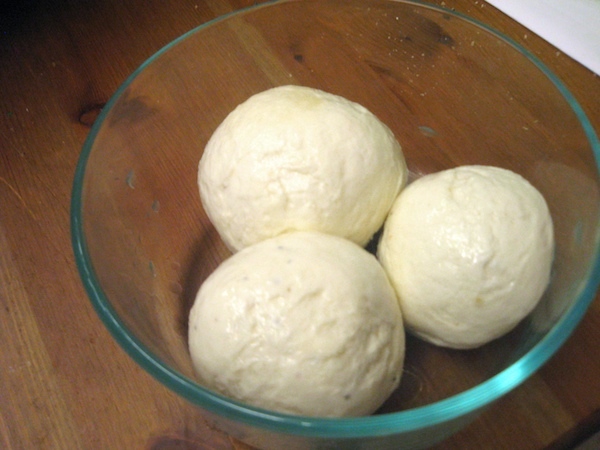 With one gallon of raw milk, I get 3 balls of mozzarella a little smaller than baseballs. I did the math and I’m still saving about $5 compared to buying fresh mozzarella from the market. Plus, my cheese is raw, especially since you don’t heat the milk over 88 degrees. 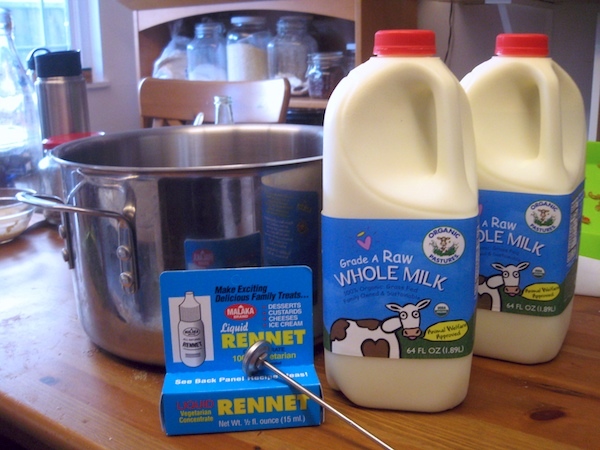 For those that don’t want to use raw milk – I know quite a few people who do not use raw milk with great success. The big thing is that you will not be able to make any form of cheese with ultra pasteurized milk. Also, for those that don’t want to use a microwave, you can use the pot of hot whey on the stove for the heating-and-kneading steps. Put the ball of curd back in with a big slotted spoon, and heat it until it’s almost too hot to touch. Good stretching temperature is 175 degrees. Making mozzarella in my house means pizza night! 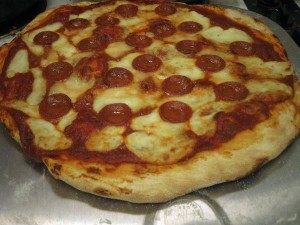 I make the dough, Marc makes the sauce, and the kids just love it!!! Really easy to make and REALLY yummy!! I highly recommend it! !